Children: Evie Natasha, Lorna and Molly. Biography: With his recent film and television work, the British-born actor has ained two distinct reputations for himself: as the hard man and the lover. As well as playing Alec Trevelyan (006) the good-guy-turned-bad-guy who opposes Pierce Brosnan's Bond in Goldeneye and Sean Miller, the terrorist who pursues Harrison Ford in Patriot Games, Bean has shown a more romantic side to his personality as the compromised photographer in A Woman's Guide to Adultery and as Mellors, the gamekeeper lover in Lady Chatterley, Ken Russell's TV adapatation of D H Lawrence's famous novel. 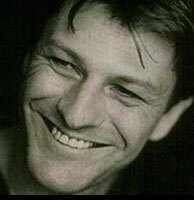 Thanks to Nona from The Compleat Sean Bean Page for the help!